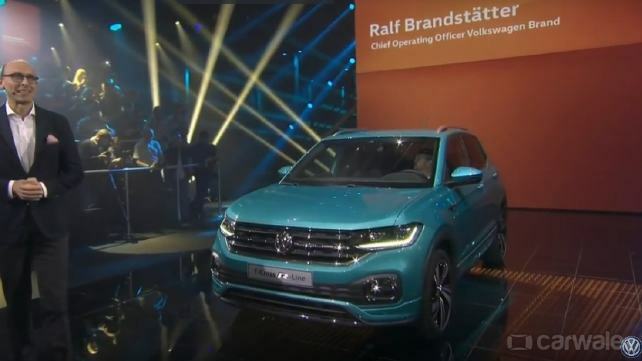 Volkswagen has officially taken the wraps off the all-new T-Cross at a special premiere in Amsterdam. The T-Cross is the fourth and smallest product in Volkswagen growing SUV line-up after the Tiguan, T-Roc and the flagship Touareg. The T-Cross is essentially a new-gen Polo-based SUV and it will be making its way to India as well, as a part of Volkswagen’s India 2.0 strategy. Based on the same MQB platform as the Polo, the T-Cross carries the essential Volkswagen SUV design with strong creases and subtle overall styling. Volkswagen says the T-Cross will have a host of customisation option with no less than 12 colour variants to choose from. It will also have an equal number of interior personalization options just like the new-gen Polo. The fascia appears to be that of a downsized Touareg. The horizontal grille gets full-width louvres elongate all the way to the headlamp which is, in fact, akin to the T-Roc. The front bumper gets integrated fog lamps in a black insert. But the most interesting part the T-Roc is the dual tone multispoke alloy wheels which can also be matched with the body colour for added personalisation. The profile is also similar to other VW SUVs which means it has sharp creases and prominent wheel arches. The T-Cross is compact yet spacious according to Volkswagen. At the rear, the tail lamps are joined by black inserts that run along the tailgate. The LED tail lights are unique and match the character of the SUV. Although there isn’t a floating roof design as the T-Roc, there will be a two-tone paint scheme for the exterior as well. Based on the same MQB-A0 platform as the new-gen Polo, it measures 4,199x 1,760×1,568mm in dimensions. Although the T-Cross is compact, it offers best in class cabin space as well. VW has also confirmed a boot size of 455litres which can be expanded to 1,281litres with the 60:40 seats folded down. On the inside, there is a fully digital cockpit. The centre console has an eight-inch touchscreen infotainment system with all the connectivity features expected in modern day cars. As mentioned earlier, there will be a choice of 12 interior colours which will be dominated on the dashboard and all around the cabin. The five-seater also has nicely sculpted front seats and a host of stowage places. There is a 300Watt Beats music system with eight speakers and four USB points. There is a host of active and passive safety equipment such as lane assist, blind spot detection, and pedestrian warning, to name a few, making it the safest car in its segment. Since it is based on the same platform as the Audi A1 and VW Polo, it will be powered by the same set of engine options. This includes 90bhp 1.0-litre turbocharged three-cylinder petrol engine and a 95bhp 1.6-liter turbodiesel. A 1.5-litre turbo petrol four-cylinder with 145bhp will also be added later. The all-new T-Cross will hit the streets in the middle of April next year in the international markets. It will come to India as a sub-four metre SUV as a part of Volkswagen’s India 2.0 plan, but that will happen around 2021. Along with a different platform (MQB-AO-IN), it might adopt a different name for the Indian market where it will rival the likes of Maruti Suzuki Vitara Brezza and Ford EcoSport.